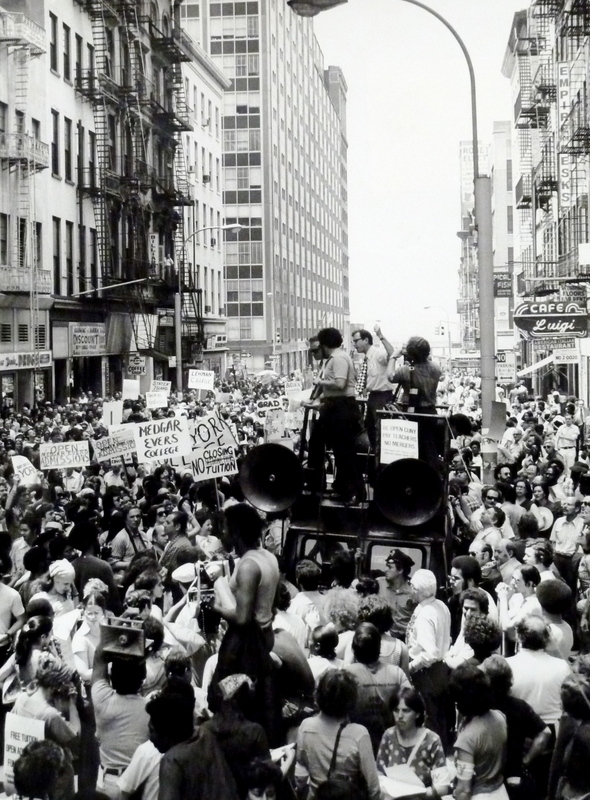 The Professional Staff Congress (PSC), the union of CUNY faculty and staff, staged this demonstration in 1976 in the midst of the city's fiscal crisis. Colleges were being threatened with closure and budgets were being cut. Union members urged the leadership to be more forceful in the fight for funding. As the signs indicate, students from across the university were also out in great numbers to defend Open Admissions and take positions against tuition and agains school closings. Cite This document | “PSC demonstration at Chambers St. Near City Hall,” CUNY Digital History Archive, accessed April 25, 2019, http://cdha.cuny.edu/items/show/5642.